Every dog poops. Unlike me and you, dogs don't poop in the toilet. They usually do their business outside in the grass. Now, just because you can't flush poop down the grass like with a toilet doesn't mean that it's OK to leave your dog's poop there. Some people may believe that dog poop is good fertilizer, but the truth is that it's not. Dog poop is actually a pollutant that will kill grass. Today, I am proud to co-host the Scoop That Poop Campaign that was created by Sugar the Golden Retriever of the blog Golden Woofs to raise awareness on the importance of picking up your dog's poop. The other co-hosts of the campaign include My GBGV Life, BoingyDog, The World According to Garth Riley, Terrier Torrent, Dogster and Oz the Terrier. Dogster has collaborated with Golden Woofs to create the infographic below. 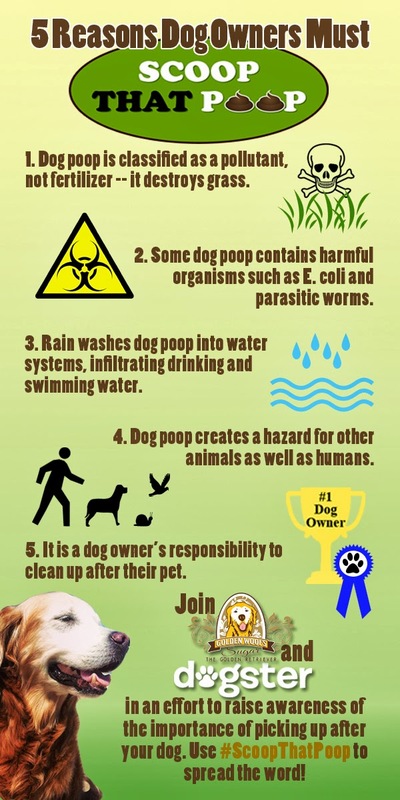 Listed on the infographic are some reasons why dog owners should scoop their dog's poop. Remember that when you bring a dog home, their poop is also part of your responsibility. You can't just leave it laying on the ground! Dog poop can be compared to trash and litter that is thrown on the ground. Both are harmful to the environment as well as the creatures that live there. 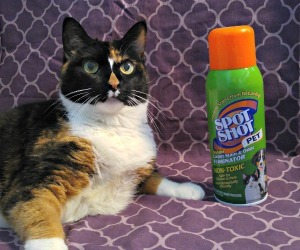 Do you want to be known as a "litter-bug"? If not, be a Scooper Hero and Scoop That Poop! If you'd like to help raise awareness about this important matter, please spread the word on your blog or social media outlets. Use the hashtag #ScoopThatPoop. 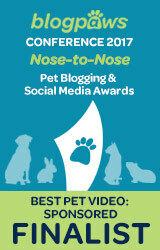 If you're a blogger, feel free to join the blog hop below with your dog poop related blog post. 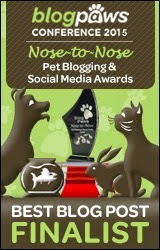 If you're not a blogger, then stop by the posts below and learn more about the dangers of dog poop and how you can be a Scooper Hero. So many sapiens really do believe that dog wastes are fertilizers! Myth! Scooping the poop is an easy thing to do and it might keep another animal from getting super sick.....just takes a second to scoop! we are proud that not only do we pick up OUR poop, we pick up everyone else's too! I have read about the lengths you go to to pick up poop Caren - that's awesome! If people can't be bothered to clean up after there dogs they shouldn't own them. I'm guilty of using that 'fertilizer' rationale back in the day before I learned better. Let's get the word out to folks who are still buying it! You know, during my research over the weekend regarding dog poop I found several sites that ranked high in the search engines stating that dog poop was good fertilizer! Hopefully word will spread that it is not. Thanks for talking about this important topic. We have a poop-guy in my village, but it would be better to clean up behind the dog. dog poop can be dangerous for peeps and pets. It's just an easy stroke of work to remove the mines, so we should do it. We have some poop scooping services here that people can pay for too. I agree that it's probably just easier to pick it up afterwards though. I think y'all are on to something impawtant, and polite too! Great post, Miss Ann! Let's hope we make a difference and get more people to #ScoopThaPoop!!! This is a great post. Thanks for cohosting the hop and helping spread the word! Hi Amy, apparently the hop linky list was down this morning but it seems to be working again! good to know! i always pick it up when we're not in our yard but we sometimes get lazy in our yard. so now i know i'll have to be more proactive! Yay for scooping poop! Good to spread the word. We want a clean hood so scoop the poop is fine with us so I always take the bag lady with me, Have a marvelllous Monday. 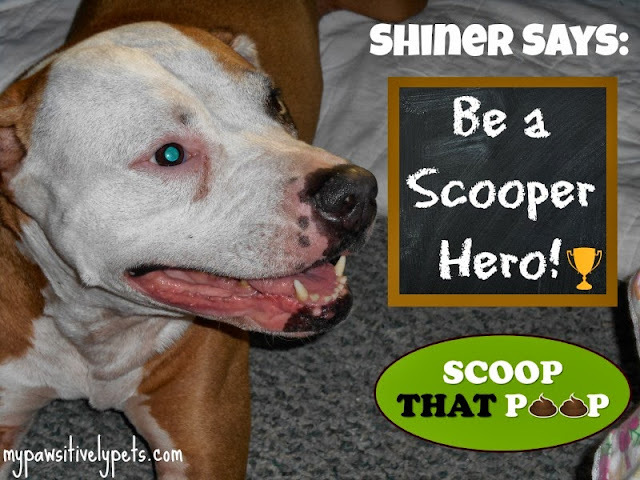 Cute pic of Shiner encouraging everyone to be a Scooper Hero! I just saw something similar over the weekend. It was like an underground doggie composting container. The dog poop just decomposes underground in this thing I guess. I scoop! That fertilizer myth seems to be a common misconception. I hope more humans learn the truth soon, and scoop the poop! Thank you for having us Sugar! Great campaign! Like Jackie I clean up the poop when taking Sookie for walks but don't always clean it up in my yard. I will try a lot harder to do it now! Too bad I can't send this post to every dog owner in our complex. They just let there dogs poop everywhere including in the garage. Then others blame the feral colony for pooping. That's not fair. Humans are just plain lazy. Hey CK - you should read post #10 on the blog hop. They actually printed out the infographic and put it up in their neighborhood with a DIY poop bag dispenser. That's awesome Simon! I have heard of similar systems being used in dog kennels. We did used to pick up most of the dog poop when a dog went in a kennel, but then there were still small bits on the ground we'd have to wash away down the drain. But....i always wonder, where do you thrown the poop after you scoop it? Well that's a good question. Just in the trash. Thanks Ann! Great to call it out like it is - trash. Great post! Thanks so much for hosting the hop. The message is a good reminder to all. Well said. It's easy picking up after me - I'm tiny and so my poops are in proportion! Hehe. But even when with my friends who are big dogs - we super pick up. Mine and others. Some humans don't deserve their poochie pals.